Mobile World Conggress (MWC) in Barcelona, Spain that has become an arena for the beginning to introduce Samsung's first mobile phone with Bada, Samsung made platform. Phone sailed wide and sharp using OLED (organic light emitting diode) was introduced Sunday (14/2/2010) with a Samsung S8500 Wave. J.K. Shin, President of Samsung Mobile Division, said the Bada development objectives through Samsung S8500 Wave is to expand the smartphone market segment. Bada is an open platform that was released Samsung to attract software developers can enhance applications that work on Samsung handsets. Wave Samsung S8500 has a remarkable feature, AMOLED display size 3.3-inch WVGA (800 × 480) with capacitive touch-screen capabilities. He has a 1GHz processor, a 5-megapixel camera (with flash), Bluetooth 3.0, GPS, 3G data, and a microSD card slot that can be stuffed with cards 2GB or 8GB capacity of onboard storage. Wave Samsung S8500 has a slim shape, made of aluminum, and has a design that we usually see on the type of upper-class smartphone. 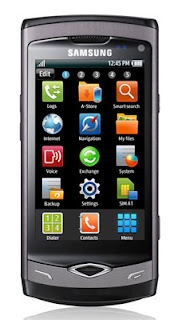 That's what makes Wave so surprising, but this phone is the first mobile phone with the operating system Bada.